If you’re nervous about starting a blog, you’ll probably be able to come up with a million reasons why not to. Well, that’s ok. I mean, no one’s forcing you to start blogging. But, if you care to find out, I’ve compiled a few reasons why I’m so glad I started blogging, and why I really think you should create a blog, too. Don’t think you have much to offer? Well, that’s where I think you’re wrong. Read the list below to find out why I think you totally have what it takes and why I think you really really want to start a blog. themselves in a similar place that I was in a couple years ago. I couple years ago, I was a working mom and found myself busy with so many things that I just wasn’t passionate about. I loved being a mom, I liked my job, but at that point, life felt like a really well rehearsed routine. Being so busy all the time, I got constantly caught up in chores I needed to take care of and never made any time to do the creative things I used to love to do- the things that helped me express who I was as a person and unwind. Not being able to devote any time to those things, I began to feel like I didn’t know who I was anymore- because I was never able to express myself creatively! Since blogging, I’ve been able to write and express myself, employ my knowledge to create a business for myself, and utilize my mad skillz to problem solve and help others! I’ve gained more confidence in myself, something I didn’t even know that I needed to do, because I’ve been able to spend much more time developing what I’m good at, and learning and delegating the things that I’m not. Besides simply getting to be creative, blogging has given me a larger sense of purpose than I ever had before! Whatever your reason for blogging- whether it’s to help people, express yourself creatively, or whatever- no one has ever said, “Naaah, I really don’t feel like making an extra income on the side with my website.” Even if you don’t plan on turning your blog into a full-time business, being able to earn an income for your efforts is going to make the time you invest all the more worth it! If you had asked me 2 years ago if I would consider quitting my job to blog full time, I would have laughed nervously and said “Yeah… probs not.” But here I am! 16 months after launching Living the Sweet Wife and blogging full time! To be honest, my daily hours from 9-5 are not filled with blogging. They’re filled with anything from changing diapers, to taking online courses, going on a date with my son, and yes- blogging. I’ll explain more later that blogging often times takes place in the nooks and crannies of the day, but it can totally work that day. But if you do have the ability to sit and work uninterrupted for several hours, wonderful! Making money on your blog is something you can start doing from day 1! (I explain how in this post). It won’t be enough to quit your day job a month after you start, but, just like any job, hard work does pay off. This is one of the things that makes a lot of people who are contemplating blogging nervous. They think, “What do I know?” or “ What would I even write about?” I had those exact thoughts when I first started blogging- two blogs ago- and trust me, you have a lot more to say than you think you do right now. I mean, if an extreme introvert like me can post regularly to two different blogs, then anyone can! Ask yourself, what is something you do regularly, and what are you really good at? Or… what is something you could go on for hours about? Do you have a story or life experience that you could possibly help someone avoid or get through because of your experience? If you’re simply really good at mom-ing, write about that! What have you learned over time that makes you so darn good at it? Or maybe you’ve spent a really long time learning and perfecting a skill, and now you feel like you can teach others how to do exactly what you know how to do! I’ve had friends say to me, “I don’t know how you come up with new things to write about all the time!” If you’re thinking the same thing, I’ll tell you what I told them: I picture each blog post I write as like a conversation with a friend. I might just be talking about something I’m passionate about. Or I might be showing my friend how to do something they’ve been trying to learn. I mean, yeah, sometimes I do get writer’s block. It happens to everyone. But writers block is usually just a sign that my brain needs to be refreshed by something new for a bit, and then after that bit, I’m right back in the game writing down helpful conversations for my online reader friends. 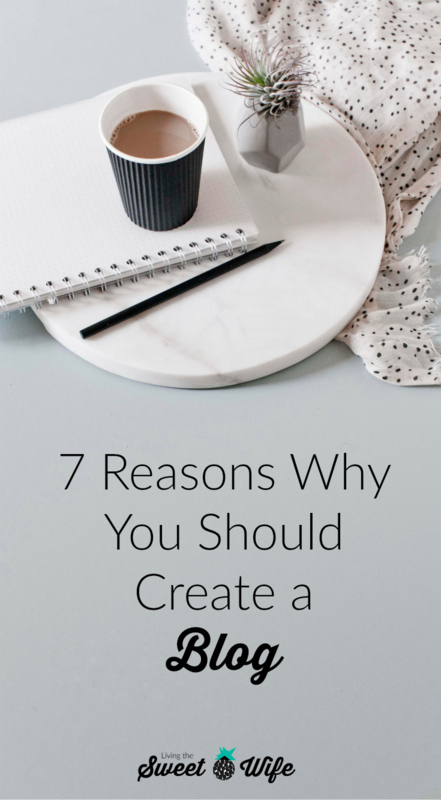 Not only do you get to love what you do and use it as a creative outlet or a business, you have yet another pretty good reason to start a blog, too- you get to help! No blog succeeds if the writer just writes for themselves. Bloggers write to relate to others and solve problems- the same problems for which so many potential readers are looking for answers! It could be anything from an easy weeknight dinner recipe to how to shoot a beautiful diy family portrait or how to change the oil in your car for the first time. When you blog, you don’t need to be revolutionary or the first person to ever do what you’re trying to do; all you need to do is relate your subject to your readers and explain it in a way that they can understand! Maybe your words will finally be what clicks to the person who’s been trying to figure something out. If they find you relatable and helpful, they’ll come back again when they have another similar problem, because they trust the answers you provide. When blogging, you don’t need to be revolutionary- you just need to relate to your readers & help in a way they can understand! One of the things that will often make a new blogger nervous about getting started is the learning curve. And it’s true, there is some new technology to learn, and if you’re not fluent in social media, there will be some learning with that as well. But a new blogger is never going to be a master of these things before they start. I knew nothing about WordPress and had never even created a Twitter account before I started blogging. And I’m still always trying to educate myself! So yes, there’s going to be some new things to learn, but they happen over time and with experience, which won’t happen if you don’t give it a shot! On New Kid on The Blog, I do my best to break down the processes every new blogger needs to know in order to have a successful start You know, the things I wish I had know when I was first getting started. Check out the link about if you’d like to tour the site, and if you’d like my FREE Blog Launch Checklist, just grab yours by clicking below! 6 | You actually DO have the time! Let me help to debunk this one for you…. When I first started blogging, I had a full time job and an infant I took care of. A year or do later I was working a part-time job, still blogging, taking 2 college courses, launching a second blog, oh yeah, and still being a mom. The thing about blogging is, no one is forcing you to do it. It’s something you only do if you’re passionate about it. And when you’re passionate about something, you find the time. I found time to blog in the nooks and crannies of the day: nap time, movie time, the nights when my husband worked late, early in the morning. Because blogging was something I really wanted to do, I decided to convert a lot of the time I spent zoning out and doing mindless activities, like scrolling through Facebook or Pinterest, to do something productive that I loved! You don’t need to quit your job to start blogging, and you don’t need to be single and kid-less either. Do you know how many successful mom-blogs are out there? The only thing a blogger needs to do to find the time to blog is to first find their passion. If they do that, the time will be there. 7 | You don’t have to be a brilliant writer. Hear me out now, being able to express yourself well is important. Extremely important. You’re not going to help anyone if they can’t understand you. But there are some who think they they need to be the next Edward Allen Poe in order to put their words on the internet. Now, grammar is something that’s important to me. But being a blogger, you get to write in your own voice and use whatever style you’re comfortable with! See, I just used a preposition at the end of a sentence, but since I’m talking with you like I would a friend, I’m ok with that. There’s a way to write conversationally and still be professional. Don’t get me wrong, correct spelling and punctuation is a must. I use Grammarly to help correct any mistakes before I publish a blog post (it’s hard to proofread your own stuff!). But when it comes to writing styles, there is a ton of freedom there! When I write a blog post, I try to imagine that I’m writing to a friend and teaching them how to do something. I want to be clear and understandable, but they’re my friend, so I’m not going to be overly formal about it. Take some time to figure out what “voice” you feel most comfortable writing in, the one you would feel comfortable writing all your blog posts in, and then do that the very best you can!! While you might be able to come up with a lot of excuses for why not to start a blog, there will always be reasons for why you shouldn’t change anything about your lifestyle: you’ve never done it before, you don’t quite know how yet, it would take rearranging some priorities. Despite these, I hope I’ve inspired you to take the plunge and start that blog and get your story and skills out there! You have more to offer than you may think and I believe in you! Still not so sure? Leave your blogging concerns in the comments below and I’ll do my best to respond to each one and tell you why there is still a reason to start blogging! This is a great post I’ve been blogging for years. But I have a friend currently debating on getting into it and I will definitely share this with him. I think 3 is what he needs the most! Blogging is such a great way to be creative. I love sharing ideas about fashion and beauty and connecting with others! I have wanted to blog for a long time. I know my passion but it is so broad. I am an arts and crafts person. Thank you for this article. I needed to read it. I think I will get back into my wordpress account and finish it. I have always wanted to create a blog. I just don’t know how to start one. I am not so “tech savvy” but I do love to help others and share experiences. I have been in the real estate business for over 20 years and I do believe I have a lot of good information to share. Besides it I have a great faith in God and passion for pepole, I know that love and dedication will always make a difference. I look forward to create a blog soon. Hope you can help me. Great blog post very inspirational. I loved your ponters. I love the creativity of blogging as well it is a fun creative outlet.